Washington County Museum is celebrating the Victorian-era inspired fantasy genre. Industrial Revolution punk-style has found its way into the Washington County Museum. The museum's "Steampunk: An Art Invitational" exhibit kicked off this month with a members-only celebration July 11 with Clockwork Rose Tea Emporium, sponsoring tea and desserts set to the music of DJ Powerless who played old phonograph records, followed by a Nikola Tesla electricity demonstration by the renowned "Dr. Professor" Don Anderson, a retired physicist and electrical engineer. Artist Cherie Savoie Tintary also provided a Steampunk photo booth for the opening event. "There were lots of fun props, like crazy goggles and hats," said Liza J. Schade, curator of collections and exhibitions for the Washington County Museum. The exhibit is now open to the public and will be on display through Thursday, Aug. 30. This collaborative exhibit features 11 artists from around the Pacific Northwest. "Washington County Museum is working to collaborate and outreach with the community more,"Schade said. "This is a great summer art exhibit to do just that." Steampunk is a genre of art based on Victorian Era trends of the 1850s through 1900s, including the styles and machinery of the Industrial Revolution, mixed with literary-themed fantasy elements, such as horror/science fiction, Wild West, nautical or apocalyptic. 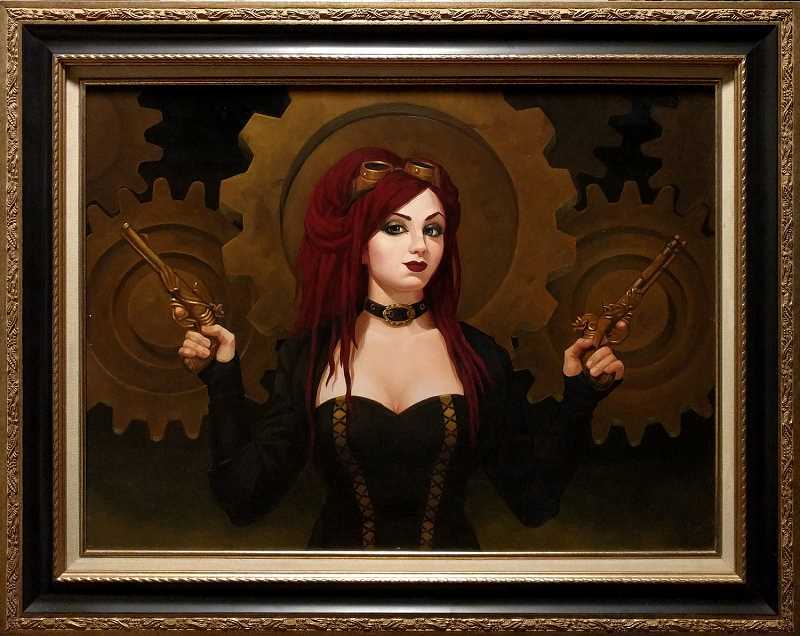 Most people have seen steampunk in one form or another, Schade said, in television, movies, books and art. Some artists describe the genre as the art of creating treasures from trash. Others are builders and engineers with a mind to make things function and have a purpose, such as furniture and machinery. 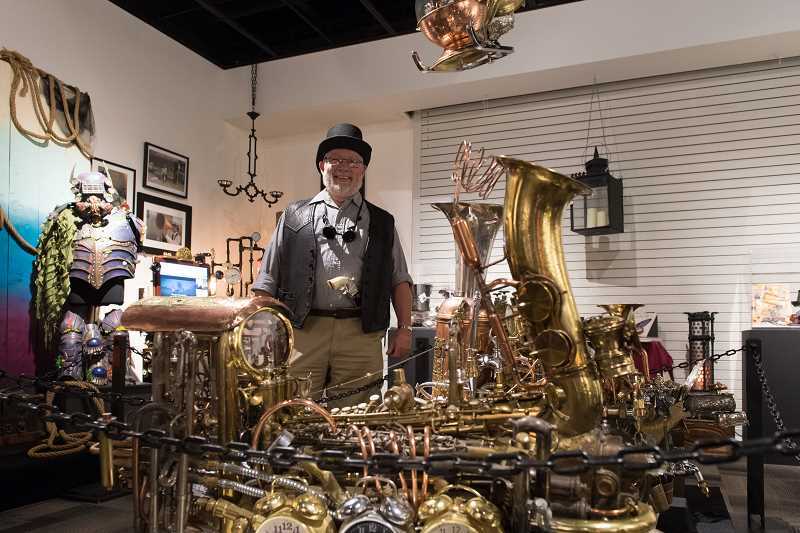 "Many Steampunk artists are into costumery, armor and accessories, such as hats and goggles," Schade said. "Yet others love visual art, like painting, fine art and photography. Whatever their passion is, the fantastic thing about Steampunk is that there are no limits to what artists can create with a little imagination, innovation and elbow grease." Artists are showcasing, and in most cases selling, all kinds of different art forms, from professional photography and fine art to amazing sculptures, jewelry, costumes, weaponry, and much more. "We are also using real artifacts and furniture from the Washington County Museum collections to supplement their displays and help create that Victorian-fantasy world," Schade said. "The artists have also inspired my own curator creativity. I am spray painting and decorating two large backdrops, one in classic Steampunk-style with cogs and wheels and the other nautical-themed." Visitors can come to see the exhibit or purchase items through August. Items can be picked up the first week of September, after the exhibit wraps up. There will be a purchasing catalog included in the exhibit for perusal, Schade said. On Saturday, Aug. 11, the museum will have a free to the public, DEMO Day from 10 a.m. to 1 p.m., where artists showcased in the exhibit will be on hand and talk and/or demonstrate their art, including artist Geahk Burchill, who will show his marionette puppets and sets and talk about how he makes them. Washington County Museum also cross-promoted with Stephen Couchman, who coordinated GEAR Con 2018, which took place at the University Hotel on July 7 and 8. The Steampunk theme at the event was World War I, to commemorate 100 years since the end of the war. They promoted the Washington County Museum exhibit to all of their vendors and the public. "I have been personally creatively inspired by all of the incredible artists that I am working with for this exhibit," Schade said. "I am super grateful to have had the chance to work with them and I think it will inspire visitors and make jaws drop in wonder."